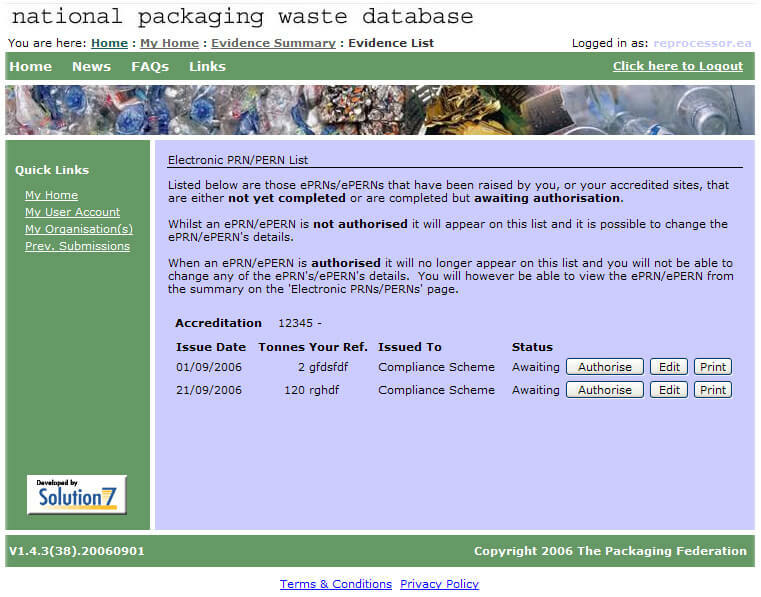 Ten years ago today the initial Beta of the National Packaging Waste Database (NPWD) went live for the first time. It was a collaboration between the Packaging Federation, the Environment Agency (EA) and Oxford based software house Solution 7. The beta was a ranging success with over 80% uptake and reducing the time to produce the key Q1 numbers by 6 weeks. The full case study is here. It was my first full cycle Agile project management gig and Ben Bradshaw’s endorsement of it in Parliament, “an unusual piece of government IT in that has been successfully delivered on-time and to budget”, still fills me with pride. What we didn’t know in 2006 is that NPWD would align so closely to Digital by Default (DbD) to the point of being a pre-cursor for it. The key principle behind Digital by Default, focus on the user need, was at the heart of the project and the resultant service. NPWD manages the evidence of recycling of packing waste and was initiated by, and largely directly paid for, by the industry users that had to prove that they had met their recycling obligations. Users, both industry and EA, were represented on the board and the project team consulted with recyclers, exporters, compliance schemes, the regulators and the producers on every feature delivered. DbD services must also be transformational. NPWD was born out of the need to move away from a paper based process that was regularly the subject of fraud (the evidence of recycling was, almost literally, a blank cheque), requiring significant changes in the regulations e.g. moving to password based “electronic signatures” which were very radical at the time. NPWD is still going strong; industry users rebelled against its planned replacement last year for not meeting their needs and being too expensive: the EA costs for running regimes like this are passed on to those being regulated. At the time, we did an informal Digital by Default service assessment, NPWD came out quite well. The only points where it might have failed is on the use of open source technology, as it uses MS .NET and SQL Server, use of GDS design patterns, as they didn’t exist at the time, and possibly point 12 about service that simple and intuitive enough so users can complete first time. Our point here was that to make it simpler would need a change in the underpinning EU regulations and the users are professional and have to understand the regime. Looking back to 2006, there were other pockets of what is now seen as good digital practice emerging across government at e.g. DVLA and Companies House. So UK Government Digital is at least 10 years old. When its history is written, as it surely will be, which will be the first service that could have been classed as DbD? Was it the National Packaging Waste Database? Perhaps we could generate a candidate list in the comments and ask the now sadly departed GDS visionary team to judge.